I just spent three weeks in Ireland, enjoying the availability of lots of wine I don’t normally see: Argentinian, Chilean, Spanish, Italian, French. We can of course get non-Australian wines here, but the range in your average off-licence can be limited, a bit like the range of Australian wines you can get in Europe. So back in Ireland I loved quaffing lots of Chilean merlots, French Côtes du Rhônes, and excellent Spanish riojas, tempranillos and valdepeñas. Back in Dan Murphy’s yesterday, I was re-stocking my woefully empty shelves. 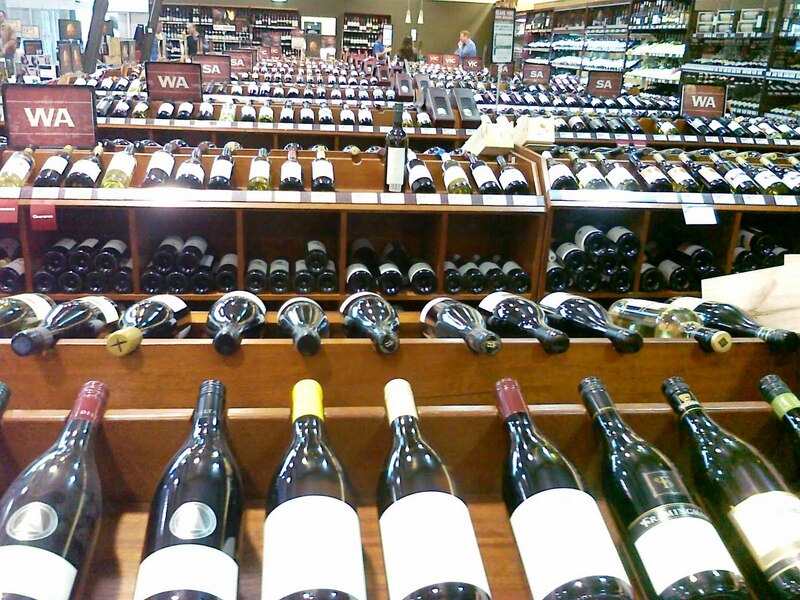 This picture was taken of Dan’s fine wines section. The rest of the warehouse is full of cheaper wines, beers and spirits stacked high. You can see from the signs that the wines are displayed in order of state of origin. Along the walls are foreign wines, mostly French and Italian, fortifieds (both domestic and foreign) and rarer, more expensive bottles. The wines lying flat on floor display are then stored below on the square shelves for selection. Each of those display bottles is a different wine from a different producer. It took me over two years to venture outside the three or four aisles of local Victorian wines: why would I? There are literally dozens of wineries within an hour’s drive of my house. I am fortunate to know the owner or chief winemaker of a handful of wineries personally. I am always tempted to return to their familiar wines but I make a concerted effort to try new bottles, especially after the Melbourne Food and Wine Show when we have the chance to try lots of new producers. This time I chose half a dozen durifs from Rutherglen – three Campbells and three of The Bruiser. I threw in three bottles of my weekday favourite, Tar and Roses, a Heathcote shiraz (well, it’s Mount Macedon next week and their over-the-counter selection isn’t fantastic). Then I went completely mad, ended up in the South Australia aisles and selected three Torbreck Woodcutters shiraz from 2008, which has superstar written all over it. Can’t wait. >Like the wine cellar in the picture. It looks awesome. >I'm no expert on European wine, but I can say that the Argentinian and to a lesser extent the Chilean wine you find at Dan Murphys is swill. It's a pity as there are some really sensational wines from both countries. I'm partial to the Chilean Carmenere and Cab Sav as well as the Argentine Malbec. I haven't tried the Campbells durif for a long time and aren't familiar with the other one you bought, but generally they need a bit of time so I hope you are patient!